TRI's rooftop design uses extra space in the sunroof compartment to reduce the height, replacing the "spinning bucket" sensor often associated with autonomous vehicles. 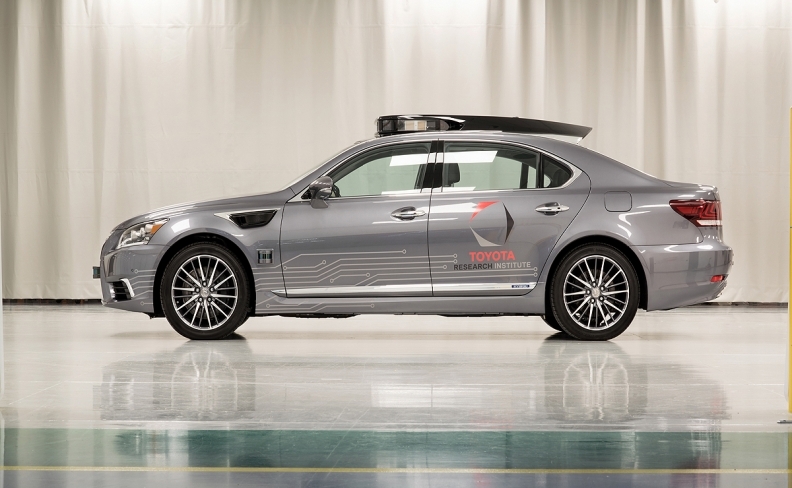 Toyota Research Institute, in its ongoing effort to develop self-driving technology, said it will use next week's CES to debut its Platform 3.0, which uses a Lexus LS 600hL demonstration vehicle with an eye toward improving perception technology. Last March, TRI introduced Platform 2.0, the first driving platform developed in-house at the U.S. institute. Six months later, TRI showcased the next iteration, Platform 2.1. "The message is, we're moving at a very rapid pace, and we're quickly developing," Toyota spokesman Rick Bourgoise told Automotive News. "It's not a matter of how long -- it's how quickly are we advancing our capabilities, technology and design." TRI will showcase the new platform Tuesday at Toyota's CES exhibit in Las Vegas. The third-generation platform includes the Luminar lidar system, a 200-meter range sensor that covers the 360-degree perimeter of the vehicle. In addition, the vehicle is equipped with shorter-range sensors, which are placed low on all four sides of the vehicle and can spot low-level and smaller objects nearby. TRI also has incorporated a rooftop panel that is temperature- and weather-resistant. The design uses the extra space in the sunroof compartment to reduce the height, replacing the "spinning bucket" sensor often associated with autonomous vehicles, TRI said in a statement. Low-volume production is slated to begin this spring, TRI said, at its Prototype Development Center near Ann Arbor, Mich.
"It's intentionally low volume because of the pace at which we're accelerating and rapidly advancing," Bourgoise said. "It doesn't make sense for us to make a large number of test vehicles when we know we're quickly advancing."